I listened to the Water Storage podcast yesterday. It was really good. I wanted to get your opinion on my water storage. We have a household of 5. I have built up to 20 cases of water along with 20 – 1-gallon jugs of water. I do keep a large trash can full of water outside available for when the power goes out so I can flush my toilets. I feel like I should be good for almost a month with my current supplies for general hygiene, drinking, and cooking. My outside supply of water would probably last several days to flush the toilet. Anything longer than a month, I feel like I should be able to collect enough rainwater to keep going if necessary. I also have a stream about a mile away that I could walk to get water. Not ideal but would do it if I needed to. I have multiple ways to boil water that I collect when the power is out. Do you think I am on the right track? I would love to hear your suggestions on other things to consider. Jason, first off, thanks for the great daily water consumption question and feedback on episode 77, Longterm Water Storage, which people can listen to by going to mind4survival.com/77 or by subscribing to the Mind4Survival podcast on iTunes or another podcast hosting service such as Stitcher, Podbean, or Google Play. First off Jason, yes, I think you are definitely on the right track with your daily water consumption. As with most preppers, you have probably done more than 99% of those around you when it comes to preparing you and your family for the hard times that may happen. After all, as preppers, we know that it’s not a matter of if something terrible will happen, but rather when something terrible will happen. When it comes to figuring out your water storage prepping and how much water you should have on hand, you first need to begin by determining how much water will your family need on a daily basis. 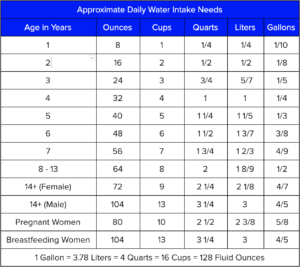 To establish our daily water needs, let’s consider the National Academies of Sciences, Engineering, and Medicine’s recommendations, which states that men need 101 ounces of water per day (~13 cups) while women need 74 ounces of water each day (~9 cups). It’s worth mentioning that based upon our fundamental water needs, the often referred to recommendation that we should consume eight, eight-ounce glasses, or 64 ounces of water per day falls short. While helping to remind people who would otherwise not drink much water, the recommendation leaves women with over an eight-ounce glass of water per day deficit and men with a nearly five glass per day deficit. With the basic water intake needs of an adult set, it’s critical also to consider the situation of each of you are planning for. Those considerations matter because without their inclusion into your preparedness plan, you may find yourself with a less sustainable supply of water than you had hoped for. Some individual considerations that you may want to consider when creating your water plan include age, environmental conditions, stress, whether pregnant or breastfeeding, along with health and fitness. Women who are pregnant or breastfeeding, require additional water. Pregnant women should drink 80-ounces of water per day (ten 8-ounce glasses), while women who are breastfeeding may need to ensure a daily water intake of up to 104-ounces (13-cups). Planning the water needs of children requires people to be flexible and attentive as their needs change over time. Without individual considerations such as environmental impacts, Children’s Hospital of Orange County recommends that children one-year of age and older intake one-cup of water each day, per year of age. So, for example, a one-year-old should intake one-cup of water per day, while a seven-year-old should drink seven cups of water per day. Another consideration with children is how to get them actually to drink enough water each day. One method is to encourage children to take small, frequent sips of water throughout the day. You can also try to make drinking water fun and turn it into a game. Regardless, take the time and effort to make sure children stay hydrated. It’s critical to stay on top of the factors that may increase your daily demand for water. 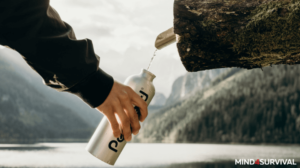 Some of the issues that may raise your daily water intake requirements are weather, temperature, altitude (8,000+ feet or above), illness such as fever, diarrhea, or vomiting, and exercise or exertion levels. Now that we know what each person’s daily water needs consist of, let’s look at the water you have on hand. Assuming that your twenty-cases of water contains the typical twenty-four, 16.9-ounce bottles, each case of water holds just over 3 gallons of water. Next, we’ll add in your twenty individual gallons of water and a ninety-six-gallon trash can of water, and total it up. Together your cases of water bottles, your one-gallon jugs, and the trash can hold just shy of 180-gallons of water. So, Jason, without knowing the ages of your children, I’m going to err on the side of caution and assume your situation is one that necessitates a high daily demand for water. Therefore, the following calculations for your minimal water consumption needs are based upon you, your wife, and three teenage sons. When those parameters are calculated in my water consumption calculator, the response tells me that you’ll need just over four gallons per day to meet your family’s hydration needs. When your daily needs are factored in with the water you have on hand, I estimate that you have about nineteen days of water stored and ready for your families drinking needs. Don’t forget that you have nineteen days of drinking water and any time you consume water for anything other than drinking; you are reducing your total drinking water supply. One way to look at non-drinking water use is like this. If your toilet uses two-gallons per flush, and you flush it twice per day, which is relatively reasonable for a family of five, you’ll use an extra four-gallons of water each day. Add in your use of water for cooking and washing dishes, with flushing the toilet, and you can quickly burn through an additional 10-gallons of water per day, if not more. This is where the truth about our concept of water use sets in. When we total up your daily drinking requirements of 4.2-gallons and your possible non-drinking water usage, of ten-gallons per day, your total estimated daily water use will be about fourteen gallons. Next, when we consider your overall on hand water storage to be 180-gallons and put it up against your daily usage, my estimates show that you should have just over twelve-days of water available, which is a bit less than the month that you are aiming for. While the reality of your situation may be surprising, you are much better off than most people. You’re also not far from achieving your goal. One other option to look at when working to increase your self-reliance by adding a Water Bob to your preps. That alone has the potential of ad another 100-gallons/10-days of water to your current supply. There are also other methods of storing water that should be inexpensive and helpful in achieving all of your water related needs. As for your question asking if you’re on the right track, yes, I think you are. I also think that you should take a little bit of a harder look at your daily water consumption needs. When you do, come up with some other methods of storing additional water. Doing so will help you make it through the next difficult time. Daily Water Consumption quote of the day. And yes it is. We can’t live without it, but at the same time, it can be a deadly foe. So, make sure you have complete plans for all of your water needs. If you have any other thoughts or questions about your daily water consumption, please leave a comment below. Thanks for reading to this post about daily water consumption?